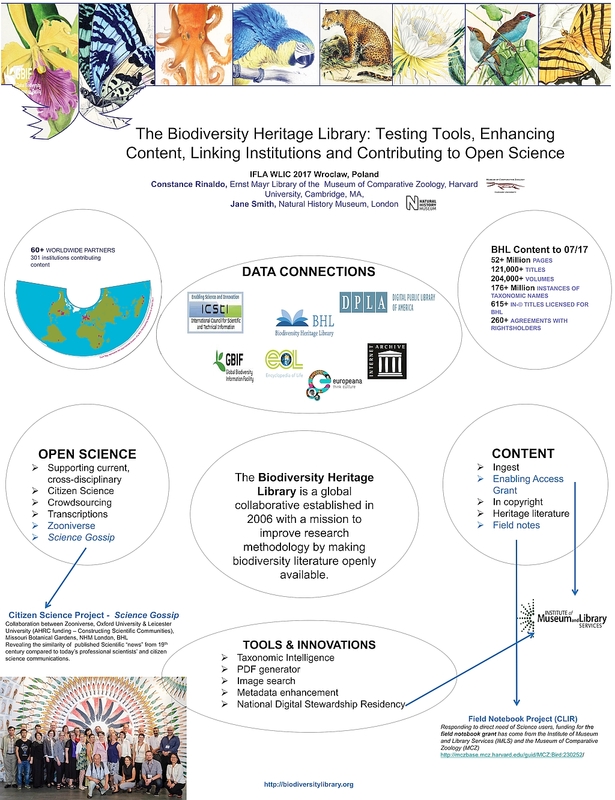 RINALDO, Constance and SMITH, Jane (2017) The Biodiversity Heritage Library: Testing Tools, Enhancing Content, Linking Institutions and Contributing to Open Science. Paper presented at: IFLA WLIC 2017 – Wrocław, Poland – Libraries. Solidarity. Society. in Session 112 - Poster Sessions. The Biodiversity Heritage Library (BHL) is a global collaborative established in 2006, with a mission to improve research methodology by making biodiversity literature openly available.. 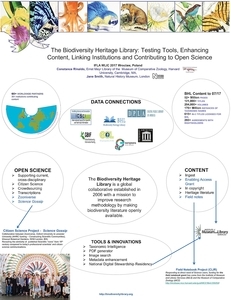 The purpose of this poster is to describe three recent grant-funded endeavors to improve BHL. The National Digital Stewardship Residency (NDSR) project, Foundations to Actions: Extending Innovations in Digital Libraries in Partnership with NDSR Learners has 5 geographically distributed partners, each mentoring a resident. The goal is to plan a next-generation digital library and tools based on user priorities, using BHL as a test-bed for incorporating transcriptions, image searching, collection analysis and connections among museums, archives and biodiversity databases. Expanding Access to Biodiversity Literature positions BHL as an on-ramp to the national digital library infrastructure, the Digital Public Library of America (DPLA). Partners provide tools, support, including training, copyright permissions and dollars, to enable small content providers to contribute via BHL to DPLA. Finally, Zooniverse (which builds and hosts citizen science projects) developed Science Gossip as an investigation into the communication of science by images in both the Victorian period and today. Images in BHL are tagged using crowdsourcing, for better access and a better understanding of the range of individuals who established early science.